One hour after 11:00 am is 12:00 pm. I find this to be very strange. Why isn't it 12:00 am? More descriptively, I thought we can think of the am/pm part as time unit representing higher amount than the numerical part. If so, it would be representing 12 hours time unit, and it switches after numerical overflows 12. Then, 11:00 am + 1hour should be 12:00 am or 0:00 pm, not 12:00 pm. What knowledge am I missing? ᴛʟᴅʀ: Virtually all style guides tell people to stop using the irresolvably ambiguous twelve o’clock ᴀᴍ and twelve o’clock ᴘᴍ in favor of twelve o’clock noon and twelve o’clock midnight. That solves the ordinals-vs-cardinals bug that comes from numbering the hours of the day, but it still leaves you wondering which day midnight belongs to. What you see with “11 ᴀᴍ + 1 hour == 12:00 ᴘᴍ” is largely an artifact of the way we keep time with a zero-based system on computers per ISO 8601, and what happens when you map a zero-based 24-hour time like 00:00:00.00000 into a 12-hour ᴀᴍ/ᴘᴍ time, which is one-based. In short, for quite a very long time (up to 2008 for at least one important U.S. government agency), it used to be that 11 ᴀᴍ and an hour was still considered 12 ᴀᴍ, even though a minute after that it became ᴘᴍ. In the same fashion, an hour after 11 ᴘᴍ was once considered 12 ᴘᴍ, and some people still interpret it that way, although computers are (now) required not to do so. That way everything made sense because an hour after eleven in the morning was still twelve in the morning, and an hour after eleven at night was still twelve at night. This is unfortunate, and surprising as you notice. And not everyone does it that way, even though computers do. That there is no consensus here about noon and midnight is the real problem. This notation has various issues and ambiguities because exactly noon is neither before noon nor after it. A similar problem exists for midnight. You are advised not to ever write ᴀᴍ or ᴘᴍ in conjunction with 12 o’clock because different people interpret noon and midnight differently. How did this happen? That’s a longer story. Here's part of it. This problem arises from a confusion between using a “traditional” one-based numbering system where one starts counting at one, and using a “modern” zero-based numbering system where one starts counting at zero. It’s like how the years of the twentieth century ran from 1901 up through and including 2000. In short, the question is whether the hours run from one to twelve and there is no such thing as zero hours, or whether they run from zero to eleven and there is no such thing as twelve hours. Once you put XII on the clock, you risk confusion. And you have to put XII on the clock because there’s no Roman numeral representing zero. When the bells of Big Ben — or any chiming clock that rings out the hours of the day — chimes with one bell, we know that the first hour has just been completed. As one commenter observes, having it ring zero bells wouldn’t tell people what time it is. You can’t go from ringing eleven bells one hour to not ringing any bells at all an hour later to then ringing one bell the hour following the one in which you failed to ring any bells at all. People wouldn’t be able to tell what time it was because of something they didn’t hear! TOM: Oh good, it’s time for lunch! JERRY: Oh really, and how do you know that? TOM: Because it has to be noon, since I just now didn’t hear the clock! Ordinals versus Cardinals: First or Zero? Alas this confusion of ordinals and cardinals starts young, back when we first teach our toddlers how to count items. When you number items using ordinal numbers, you have a first item, then a second item, then a third item. We teach our toddlers to start with one, two, three instead of with zero, one, two. The concept of zero is more complicated than a two-year-old needs. If you with perfect accuracy tell them they’re in their third year instead of in their second year when they’re “two years old”, they won’t understand you. That certainly won’t make sense to them then, and for some it may never make sense. If you think about it, we do the same thing with centuries and years as we do with hours and minutes. We think of there being a first second followed by a second second, and so on. Or that a century has a first year followed by a second year and so on. Unfortunately, this confusion of ordinals and cardinals is seldom cleared up later in life, which is why we have so many people who cannot understand why if the year is 2018, that that represents the 21ˢᵗ century not the 20ᵗʰ century. That is, they had a first hour (hora prima), a second hour (hora secunda), a third hour (hora tertia), a fourth hour (hora quarta), and so on and so forth. When one divides a calendar day into two sets of twelve hours each, as the Romans first did and as the English-speaking world and many others still do, and you number those hours from one to twelve, it makes more sense for the sequence to be 1, 2, 3, 4, 5, 6, 7, 8, 9, 10, 11, 12 in both cases, not for the sequence to be 12, 1, 2, 3, 4, 5, 6, 7, 8, 9, 10, 11 — since nobody in their right mind counts things that way: you don’t first have twelve things and then add one to it and have only one thing. The Romans therefore had two pairs of hours, one set in the day and the other in the night, so hours numbering from hora prima diei through hora duodecima diei for the hours of the day on the one hand and hours numbering from hora prima noctis through hora duodecima noctis for the hours of the night on the second hand. Swap out having a first and a second hand for having a “zeroth” hand and a first hand, and it’s no wonder people find your numbering system confusing! There is no confusion when using the words 12 noon (or midday) and 12 midnight, although the use of 12 midnight can raise the question of 'which day?'. To avoid confusion in, for example, an insurance certificate, it is always better to use the 24-hour clock, when 12:00 is 12 noon and, for example, 24:00 Sunday or 00:00 Monday both mean 12 midnight Sunday/Monday. It is common in transport timetables to use 23:59 Sunday or 00:01 Monday (in this example), or 11:59 p.m. or 12:01 a.m., to further reduce confusion. There are no standards established for the meaning of 12 a.m. and 12 p.m. It is often said that 12 a.m. Monday is midnight on Monday morning and 12 p.m. is midday. This puts all the times beginning with 12 and ending with a.m. in the same one-hour block, similarly with those ending with p.m. It can also be argued that by the time you have seen a clock showing 12:00 at mid-day it is already post meridiem, and similarly at midnight it is already ante meridiem. Times in the first hour of the day are sometimes given as, for example, 00:47 a.m., with 00:00 a.m. corresponding to midnight, but with a time twelve hours later given as 12:47 p.m. There are no standards established for the meaning of 12 a.m. and 12 p.m. Given this ambiguity, the terms 12 a.m. and 12 p.m. should be avoided. For some people, including the United States Government Printing Office before 2008, the twelve hours before noon are numbered one o’clock ᴀᴍ up until twelve o’clock ᴀᴍ, and the twelve hours after noon are one o’clock ᴘᴍ up until twelve o’clock ᴘᴍ. Then in 2008, the US GPO switched things around. To illustrate this, consider that "a.m." and "p.m." are abbreviations for "ante meridiem" and "post meridiem," which mean "before noon" and "after noon," respectively. Since noon is neither before noon nor after noon, a designation of either a.m. or p.m. is incorrect. Also, midnight is both twelve hours before noon and twelve hours after noon. But even once you do that, you still don’t know which day midnight belongs to. Is midnight the end of a day or the beginning of a day? When someone refers to "midnight tonight" or "midnight last night" the reference of time is obvious. However, if a date/time is referred to as "at midnight on Friday, October 20th" the intention could be either midnight the beginning of the day or midnight at the end of the day. To avoid ambiguity, specification of an event as occurring on a particular day at 11:59 p.m. or 12:01 a.m. is a good idea, especially legal documents such as contracts and insurance policies. Their recommendation is never to write twelve o’clock at all since its confusion can be avoided simply by adding or subtracting a second, at which point you can now safely use ᴀᴍ and ᴘᴍ again. Although another solution is to use a clearly zero-based time for the hours, that only works if everyone reading it knows it’s being used. If you just see a bare 5:00 you can’t know whether that’s really five in the morning or five in the afternoon. In most contexts there will be other non-clock hours present though, like 17:00, at which point you know which system you’re in: that’s not seventeen o’clock (a mythical time which does not exist!) but rather seventeen hundred hours. PM, also written as P.M., pm, and p.m. is an initialism for the Latin expression post meridiem whereas the English adjective, postmeridian, is derived from the Latin word postmeridianum. The older Latin expression means “after midday” or after noon (afternoon). The PM is needed as soon as the clock chimes 12 o'clock because exactly at one minute past 12:00, i.e. 12:01 p.m., it is one minute after midday. Terms 12 a.m. and 12 p.m. cause confusion and should not be used as neither the "12 am" nor the "12 pm" designation is technically correct. It advisable to use 12 noon and 12 midnight where clarity is required. To avoid ambiguity, airlines, railroads, and insurance companies use 12:01am for an event beginning the day, 11:59pm for ending it. I agree that for the precise moment of 12:00, adding PM or AM is a bit arbitrary. However, imagine we add another minute: 12:01. If this is the time that is 1 hour, one minute after 11:00 AM, then obviously, it is 12:01 PM, since it is after midday. As you can see, on the left, AM switches to PM exactly on the hour, so that every complete hour of the day falls completely within the AM or PM bracket. On the right, the first minute after 12 falls in another bracket than the other 59 minutes of that hour - I would consider that very confusing. What knowledge am I missing? It's actually the opposite. You have knowledge that the Babylonians and Romans did not have. They did not know of this strange number 0. 12 is congruent to 0 (mod 12), so XII is the number the Romans had that made the most sense between XI and I. Of course, they also didn't have digital clocks, so I expect they would have just written "meridiem" (the Latin equivalent of noon"), probably without even thinking about whether it would make more sense to say that noon is before noon (a.m.) or after noon (p.m.). In traditional time, we have two times that are labeled 12:00. We define 12:00 A.M. to be midnight and 12:00 P.M. to be noon. The latter is of course technically inconsistent with the original Latin meaning of "post meridiem." So what? September, October, November, and December are not respectively the seventh, eighth, ninth, and tenth months of our year either, yet no one is confused. 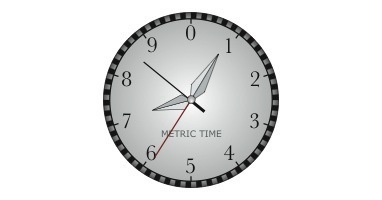 You have looked at the conventional method for writing the time of day and have tried to interpret it as a kind of place-value system, somewhat like decimal numbers or binary numbers except that the number of different "digit" values you can put in one of the places is not necessarily the same as the number of values you can put in the next place. This would be a mixed-radix place-value system. But place-value systems typically allow any of their digits to be zero. In binary, as you count up each digit changes from 0 to 1 and then to 0 again; in decimal it goes from 0 to 1 and so forth up to 9 and then to 0. When telling time, the minutes and seconds also follow this rule: after 59 we have 0. But the hour is an exception: the next hour after 12 is 1. Worse still, the change in the date doesn't occur then, but occurs one hour earlier, between 11:59 pm (one minute before midnight) on one day and one minute after midnight on the next day. The only way I can see to make sense of this, viewed as a conventional mixed-radix place-value system, is to treat the 12 in "12 o'clock" as a special convention for the way to write a zero in that place. That is, 12:00 really means 0:00 even though it is not written that way. The other alternative is to consider 12 as meaning 12, but recognize that conventional time-telling is not a normal place-value system in which each digit is incremented at the same time the digit in the place next to it "rolls over." For conventional time-telling, "am" becomes "pm" sometime in the two minutes between 11:59 am and 12:01 pm, either directly at 12:00 pm or through the intermediate value "noon" at 12:00 noon, and the rollover of the hours occurs one hour later. Basically it's because clocks round down. When (during daytime) does a 12-hour digital clock display 12:00? It does so for the period between noon and one minute past noon. This period of time occurs (immediately) after noon. Thus, when it is displaying 12:00 it will also display PM. A more precise digital clock might only display 12:00:00 for a one-second period, but again, that period is the first second of the afternoon, not the last second of the morning. Q: One hour after 11:00 am is 12:00 pm. I find this to be very strange. Why isn't it 12:00 am? ... Then, 11:00 am + 1hour should be 12:00 am or 0:00 pm, not 12:00 pm. What knowledge am I missing? When you see 12, it's past 12. When you see "AM" it's "at morning", when you see "PM" it's "past morning". Noon is thus (wrongly) past midday, with midnight (equally wrongly called) past midnight. That makes more sense if you think of twelve as equal to zero. 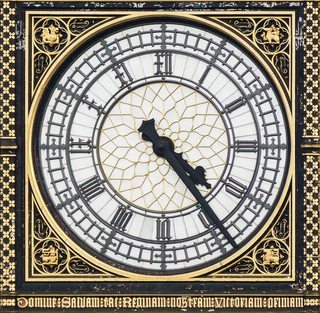 The 12-hour clock is a time convention in which the 24 hours of the day are divided into two periods: a.m. (from the Latin, ante meridiem, meaning before midday) and p.m. (post meridiem, meaning past midday). Each period consists of 12 hours numbered: 12 (acting as zero), 1, 2, 3, 4, 5, 6, 7, 8, 9, 10, and 11. The 24 hour/day cycle starts at 12 midnight (often indicated as 12 a.m.), runs through 12 noon (often indicated as 12 p.m.), and continues to the midnight at the end of the day. It is fair to say, however, that the shortest measurable duration after noon should be designated as p.m. For example, it would be applicable for a digital clock changing from 11:59:59 a.m. to 12:00:00 to indicate p.m. as soon as it the 12:00 appears, and not delay the display of the p.m. by a minute, or even a second. The same is true for midnight, but there is an added issue of which day midnight refers to (see below). Hours of operation for a business or other references to a block of time should also follow this designation rule. For example, a business might be open on Saturdays from 8 a.m. to noon or weekends from 3:30 p.m. until midnight. To avoid ambiguity, specification of an event as occurring on a particular day at 11:59 p.m. or 12:01 a.m. is a good idea, especially legal documents such as contracts and insurance policies. Another option would be to use 24-hour clock, using the designation of 0000 to refer to midnight at the beginning of a given day (or date) and 2400 to designate the end of a given day (or date). See the Wikipedia webpage "Confusion at noon and midnight" for more info. The University of Basel holds one of the oldest Sundials ever discovered dated to the 19th dynasty, or the 13th century B.C., the sundial was found on the floor of a workman's hut, in the Valley of the Kings, the burial place of rulers from Egypt's New Kingdom period (around 1550 B.C. to 1070 B.C.). The semicircle is divided into twelve sections of about 15 degrees each. A dent in the middle of the approximately 16 centimeter long horizontal baseline served to insert a wooden or metal bolt that would cast a shadow to show the hours of the day. Small dots in the middle of each section were used for even more detailed time measuring. The website Sign of the Times has a webpage about this, as does Wikipedia. 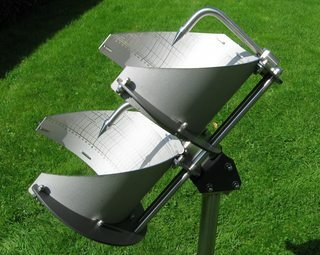 Solar time is directly derived from the Sun's position, by counting one hour of time every 15° of hour angle as Earth is rotating around its axis in 24 hours, which gives 360°/24 h = 15°/hour. So, 15 * 12 = 180, thus half a circle measures 12 hours. The earliest clock was the Waterclock, dating to 4000 B.C., and a popular clock was the Sandclock (~ 150 B.C. ), as it was portable, kept time at sea, and is inexpensive. 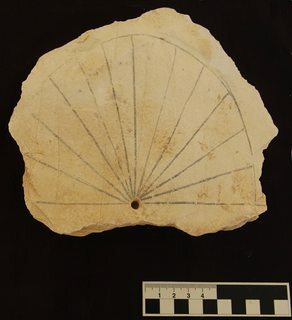 Neither was accurate unless calibrated to a Sundial, though early Sundials suffered from their own inaccuracies and early Waterclocks came before Sundials and thus measured arbitrary intervals (like the nadika, or 24 minutes). The parentheses ( & ) indicate that the adjacent number is not inclusive, i.e. that it is excluded from the range. The brackets [ & ] indicate that the adjacent number is inclusive, i.e. that it is included in the range. The words ante meridian and post meridian mean "before midday" and "after midday" respectively. They don't define what happens at exactly midday, so AM is (midnight-midday) and PM is (midday-midnight). Also, midnight is both before and after midday, depending on your perspective. If you accept that the nanosecond after midday, it is PM, and that the limits of human perception are no more precise than a hundredth of a second, then by the time you've registered that it's midday, it's already afternoon. It then makes sense to call 12:00 noon "PM". So, we can now make the definition more precise and say that AM is [midnight-midday) and PM is [midday-midnight). Although this makes sense, it is non-intuitive, which is why many style guides still recommend avoiding the usage of either 12:00 AM or 12:00 PM. However, since we are surrounded by digital devices and those devices always call noon 12:00 PM, eventually we will all get used to it and just accept it, even if we don't know the reason behind it. Perhaps we should be asking "Why is midday 12:00 and not 1:00?" The other answers here seem to complicate matters. This means that precisely noon should have neither the AM nor PM suffix. This also means that even the tiniest fraction of a second after noon does require the PM suffix - as does every other time before 1pm (for example: 12:01PM, 12:02PM, 12:03PM, ..., 12:59PM). Given this pattern of all other times after noon and before 1PM having the PM suffix it is, therefore, common to (incorrectly) assume that 12:00 noon also needs to be labelled PM but, as shown above, this is not the case. Something + “now and then” + colon + “a journey…”: just standard adverbs? Can we say “I'll be there one hour later” instead of “I'll be there in an hour”? Is there an English term to describe the change from one time increment (e.g. hour) to the next? How to say something that will happen at X minutes every hour? Should you add AM or PM after a 24 hour time? How should I say this hour in words: “03:01:00”? Why is it “half an hour” instead of “a half hour”?